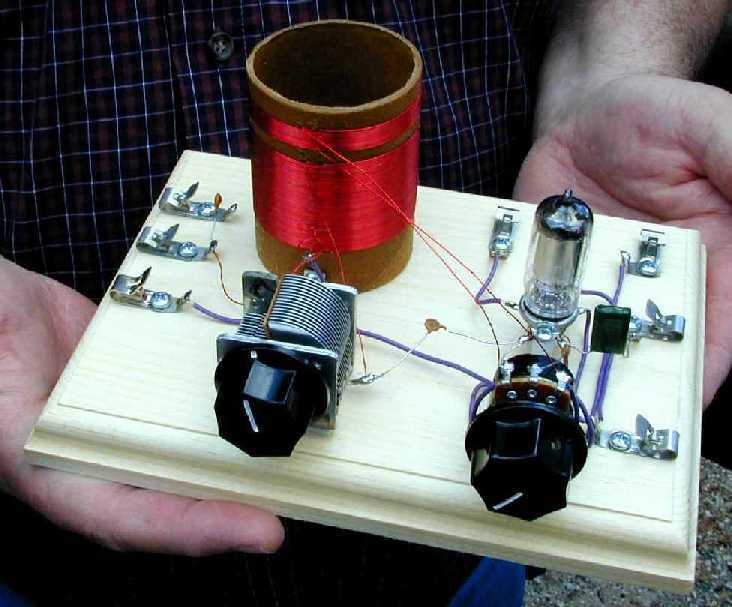 Build An Armstrong One-Tube Radio! This little radio is the distillation of many circuits for one-tube sets that have appeared since Edwin Armstrong invented the regenerative circuit in 1912. It uses the best features of many one-tube sets and has features not found on most radios of its type. One feature is the capacitor coupling of the audio output. This feature prevents the “B” voltage from passing thru the headset and possible ruining the magnets. It also allows direct connection to amplifiers without further circuitry and allows the use of crystal earplugs when connected in series with a 10K ohm resistor. The capacitor coupling makes the detector more stable and reduces the “hand capacity” effect, thus making regeneration adjustment much easier. Another feature is the autotransformer type coil that allows better coupling of the signal from the antenna and helps prevent the antenna circuit from loading down the detector and making it tune broadly. The tuning of this little radio is very sharp for a one tube set. Only the finest of components are used. One example is the vintage style air variable capacitor. These are custom made from an old design by skilled American craftsmen in U.S.A. They are very precise and smooth. No other one-tube set sold today offers all of these special features. Battery life is outstanding. The 3S4 vacuum tube filament only draws 50 milliamps so the "A" battery, consisting of two standard "D" cells, will last hundreds of hours. The "flywheel" effect of the regenerative circuit causes the "B" battery life to be even longer, lasting many hundreds of hours. The "B" battery consists of five standard 9-volt batteries. The Armstrong One Tube Radio covers the Standard A.M. Broadcast Band from 550 KHZ to 1700KHZ. Its powerful circuit pulls in amazing BCB DX from hundreds of miles away. Customers have reported distances over 1500 miles when conditions are right. One customer reported that, "The Performance is AWESOME!" You will love building this little jewel. It is easy to construct and the directions are very easy to understand and follow. Nothing can compare to the thrill you will have sitting in a darkened room, lit only by the barely perceptible glow of the single vacuum tube, while listening to your favorite shows, or distant DX stations, on this little Armstrong One Tube Radio that you built by yourself. These great looking, high quality vintage style kits are designed to be just like homebrew radios that were built in the 1940s and 1950s by radio hobbyists in the great vacuum tube era. Only the best vintage type parts are used. The kits contain the American Made air variable tuning capacitor, in-circuit tested N.O.S. 3S4 vacuum tube, tube socket, fahnstock clips, solder lugs, resistors, capacitors, regeneration potentiometer with switch, coil form, mounting brackets, stand-offs, screws, magnet wire, hook-up wire, knobs, battery holder for "A" batteries, battery clips for "B" batteries, and the fine quality ready-to-finish routed wood plaque for the base. Everything is included except the batteries, headset and antenna. Soldering is required. This set requires a high impedance magnetic headset. Order one today! With U.S. Priority Mail, it will be at your home in two or three days! You can put it together in one or two enjoyable evenings and then you can have years of pleasure listening to it and looking at it! Plus U.S. Priority shipping according to your Zip Code plus $2.00 handling in USA. Please email us for the cost of Priority shipping to your address. 1. For Mail Orders : Email us and provide your Zip Code. We will reply with your total including shipping & handling. 2. For Credit Cards: Email us and provide your Zip Code. We will reply with your total including shipping & handling, Then click on the PayPal logo below and follow their simple instructions for sending money. You will need our PayPal address.